My daughter loves Spongebob Squarepants so this hamburger is inspired by the Krabby Patty. There’s really no pattern. Most of the food is worked in rounds except for the cheese which is more of a granny square. I put in a few extra single crochets into the last round of the lettuce to make it frilly. She loves it, and I really enjoyed making this. 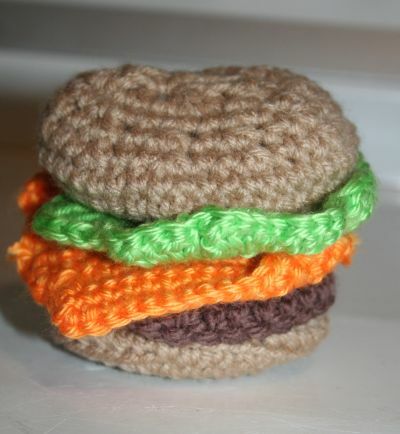 Amigurumi food is just so cute and has way less calories than its real counterparts.